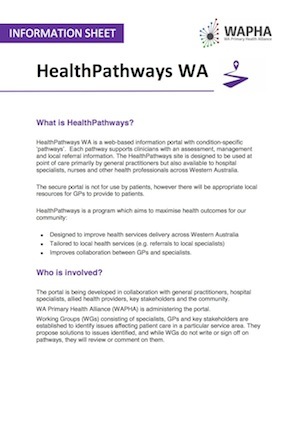 HealthPathways WA is a web-based portal with condition-specific ‘pathways'. Each pathway supports clinicians with assessment, management and local referral information. The HealthPathways site is designed to be used at point of care primarily by general practitioners but is also available to hospital specialists, nurses and other health professionals across Western Australia. The portal is being developed in collaboration with general practitioners, hospital specialists, allied health providers, key stakeholders and the community. The WA Primary Health Alliance (WAPHA) is administering the portal. Working Groups (WGs) consisting of specialists, GPs and key stakeholders are established to identify issues affecting patient care in a particular service area. They propose solutions to issues identified, and while WGs do not write or sign off on pathways, they will review or comment on them. HealthPathways is efficient, simple and quick to use. It will assist GPs to provide the most effective treatment and find local specialists and services for their patients. Access assessment and management options, and information on referrals to local specialists and services. Patients will get the right treatment or specialist care with shorter waiting time. GPs will also have quick access to educational resources for patients which will enable them to better manage their own health. Continuous improvement and scheduled formal reviews. Download HealthPathways WA fact sheet (PDF). Make a suggestion or send us feedback. Find out how you can receive CPD points for participating in the HealthPathways project. Cancer Screening, Orthopaedics, Older Adults' Health, Gynaecology, Gastroenterology, Nephrology, Dermatology and Rheumatology. 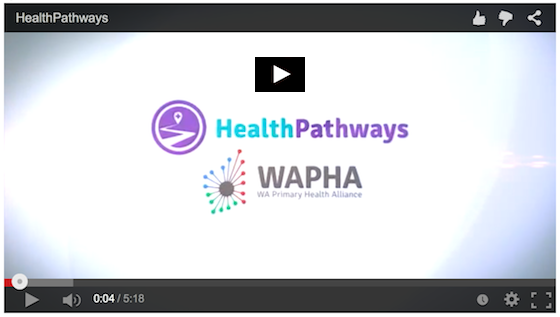 Watch the HealthPathways WA YouTube video (new window).